Update, May 18, 2016 at 12:20 p.m.: Hillary Clinton on Wednesday morning declared victory in Kentucky, though Bernie Sanders has yet to concede. With 99 percent of precincts reporting, Clinton is leading Sanders 46.8 to 46.3 percent, according to the Associated Press. If that tally holds, each candidate will win 27 delegates. Hours after the polls closed Tuesday, nervous network execs still hadn't called Kentucky's Democratic presidential primary. By midnight, former secretary of state Hillary Clinton was leading Sen. Bernie Sanders (I-Vt.) by fewer than 2,000 votes out of 455,000 cast, with all but four precincts reporting. Across the country, the results were far clearer: Sanders won Oregon by roughly six percentage points. His wife, Jane O'Meara Sanders, delivered the news to him as he addressed thousands of supporters at a rally in Carson, Calif. Though Sanders likely netted several delegates to the Democratic National Convention on Tuesday, Clinton crept ever closer to the majority she will need to seal the party's nomination. Including some but not all of those awarded Tuesday, Clinton was leading Sanders 1,767 to 1,488 among pledged delegates, according to the Associated Press. Counting superdelegates, Clinton had reached 2,291 — less than 100 shy of the 2,383 she needs. But as he does nearly every election night, Sanders declared in Carson that he would remain in the race "'til the last ballot is cast." Tuesday's contests came as tensions between the two campaigns flared over a chaotic Democratic state convention last weekend in Nevada. According to media reports, Sanders supporters disrupted the proceedings at a Las Vegas casino Saturday following a disagreement over the convention's rules. Witnesses accused them of throwing chairs, harassing Clinton supporters and, later, sending threatening text messages to the chair of the Nevada Democratic Party. Several high-profile Democrats, including Senate Minority Leader Harry Reid (D-Nev.) and Sen. Barbara Boxer (D-Calif.), urged Sanders on Tuesday to rein in his supporters. But in a statement issued that afternoon by his campaign, the candidate defended them and criticized the Nevada party for using "its power to prevent a fair and transparent process from taking place." "The Democratic Party has a choice. 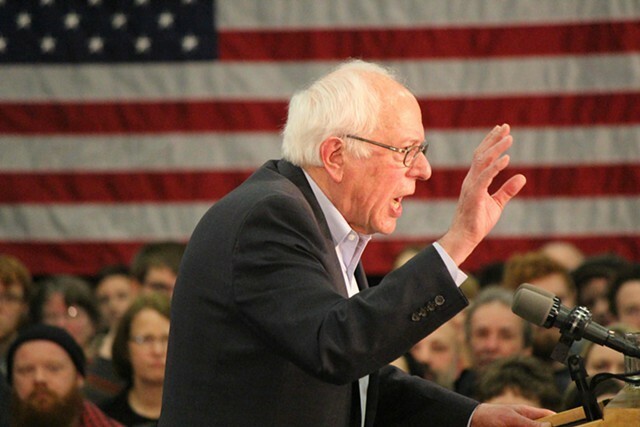 It can open its doors and welcome into the party people who are prepared to fight for real economic and social change — people who are willing to take on Wall Street, corporate greed and a fossil fuel industry which is destroying this planet," Sanders said in the statement. "Or the party can choose to maintain its status quo structure, remain dependent on big-money campaign contributions and be a party with limited participation and limited energy." Speaking Tuesday night on CNN, Democratic National Committee chair Debbie Wasserman Schultz slammed Sanders' statement. "Unfortunately, the senator's response was anything but acceptable," she said. "It certainly did not condemn the supporters for the violence and added more fuel to the fire."